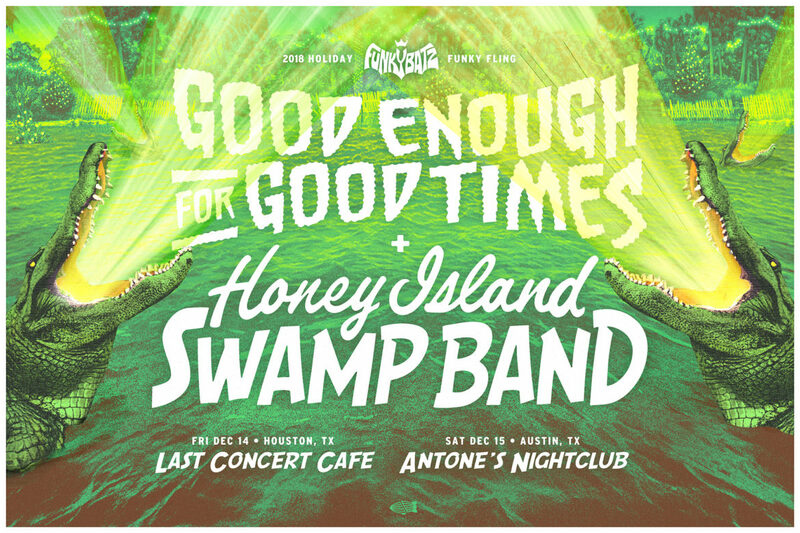 Good Enough For Good Times , featuring Rob Mercurio (bass) and Jeff Raines (guitar) from Galactic, Joe Ashlar (keys) and Simon Lott (drums). “We started up as a band due to the lack of musicians in New Orleans following Hurricane Katrina. A lot of the club owners were calling around asking musicians to put something together to fill their empty stages. We came together to play for them (or for us), the New Orleans’ folks who came home after the storm and needed to hear some good music to get their minds off off the crazy SH*T that was going on around them. We had such a great time playing together that we just continued to do it. Great music begins with great songs, and great songs are what the Honey Island Swamp Band is all about. The band came together when Aaron Wilkinson (acoustic guitar, mandolin, vocals) and Chris Mulé (electric guitar, vocals) were marooned in San Francisco after the levee breaches following Hurricane Katrina devastated New Orleans. After a chance encounter with fellow New Orleans evacuees Sam Price (bass, vocals) and Garland Paul (drums, vocals), and with no prospects of getting home any time soon, they figured they’d better cook up something new, and quick! A few days later they had put together a song list, landed a weekly gig at San Francisco’s Boom Boom Room, and settled in to share a little taste of Southern culture with their new West coast neighbors. Their 7-song eponymous debut was recorded in 2006 at famed Record Plant studios in Sausalito, CA, and was received so well that the band decided to make the new group priority number one upon moving back to New Orleans in early 2008. Honey Island Swamp Band’s music has been described as “Bayou Americana”, with timeless songs from Wilkinson & Mulé, highlighted by Mulé’s searing guitar, Wilkinson’s sure-handed mandolin, and 4-part vocal harmonies, all anchored by the powerful groove of Price & Paul’s Louisiana stomp rhythm section. The addition of Trevor Brooks on Hammond B-3 organ to the HISB family in 2010 has rounded out the band’s sound, which draws from a variety of influences in the world of roots music, including artists such as Lowell George & Little Feat, The Band, Taj Mahal, Gram Parsons, Jerry Garcia, Johnny Cash, Jimmy Reed, Clarence “Gatemouth” Brown, and New Orleans’ own Earl King and Dr. John.